Monarch Beverage Company is a beer and wine wholesaler based in Indianapolis delivers about 16 million cases of beer and wine per year throughout Indiana. Not only do they have about 80 to 90 routes per day for local delivery, they also have a bulk-freight division. The company’s size and logistical operations means that they have quite a need for managing the logistics of their fleet, routes, and driver behaviour. 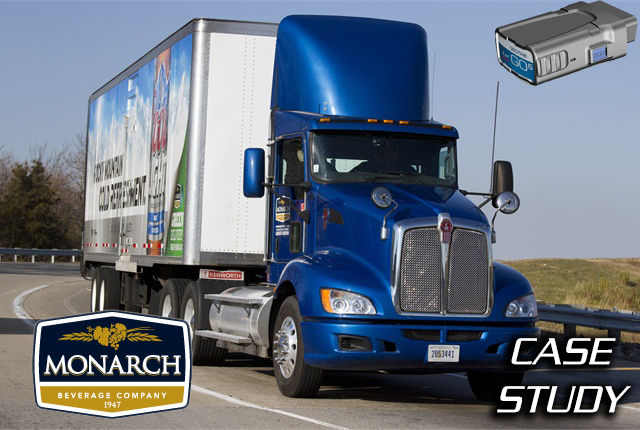 Today, Monarch has Geotab GO6 units installed in 120 of their delivery and bulk delivery vehicles. The company’s data collection efforts weren’t always so successful though. Let’s look at how their smart thought-process towards fleet tracking and data collection serves as good model for how fleet tracking can improve the efficiency of many companies. Employees who don’t have the time/skills to comb through mountains of data to find what’s important: they became disinterested quickly, and needed information in a more digestable way. Kindle knew that the company had to sit down and take a long look at their data collection to better fit the needs of the organization. The company looked at their fleet management efforts from a number of different viewpoints, and realized that maybe what they had didn’t perfectly fit their operational needs. Now, products like the GeoTab tracking device are giving them data in a way that’s readable, and not only reports on past usage, but also gives them significant insight toward their logistics going forward. Data Integration: “No perfect solution exists — but perfect partnerships do.” Choose vendors with best-in-class technology that integrates with current systems — and each other — to help you get there. Create a platform where technology works together seamlessly. Vendors must be willing to collaborate at a reasonable price point. Data on its own is not that useful — the ability to integrate past data into their current existing software system with that information that really happens in the field is invaluable. Kindle said that on the whole, working with systems like Geotab has provided his company tools that they can use to manage their employees more effectively. They’ve significantly lowered costs associated with maintaining a delivery fleet, and they’ve been able to better develop, monitor and improve KPIs and metrics of success. To wrap up his presentation, Kindle makes three main suggestions and points of guidance for businesses looking to maximize the effectiveness of their fleet tracking through tools like GPS to GO’s Geotab system. Fleet-tracking technology is only as good as the technology partners who are supporting it — choose your partners wisely. Begin with the end in mind — develop your own critical questions as they relate to your operation. Sit down, think about, what are you trying to accomplish in the next four to five years. Vendors they worked with all had two things in common — ease of integration, coupled with unparalleled customer service and support. Ready to re-think your company’s fleet management strategy and take your business to the next level? Get rolling today with our $50 trial offer. Give our fleet tracking system a try, with no contract, the ability cancel anytime, and purchase whenever you’re ready to get the $50 credited.